The Pisces New Moon on March 8, 2016, is a Total Solar Eclipse that sends us on a magical mystery tour. Every New Moon is like a cosmic reset button that kicks off a new monthly cycle. But when the New Moon eclipses the Sun, the reboot is more sudden and more powerful. There is often an unexpected shift in the energy when a Solar Eclipse stirs the cosmic soup. During this New Moon and Solar Eclipse, we are riding an emotional rollercoaster with fantasy-prone Neptune also activating our dreams, taskmaster Saturn pulling in the reins, and boisterous Jupiter making everything seem bigger and better than it actually is. It's nearly impossible for us to find stability with so many planets battling for center stage during this eclipse. Nevertheless, there is a blessing hidden within the depths of this surreal Pisces Solar Eclipse's relationship to Jupiter. 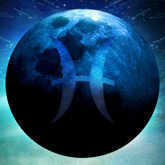 The real gifts of Pisces are sensitivity and compassion. Our willingness to step outside of our narrow perspective empowers us to grow emotionally and spiritually. But we don't have to fall victim to the consequences of ignoring boundaries as our dreams overflow into the real world. We can call on karmic Saturn to help us make responsible decisions. Anything is possible once we acknowledge our limits. Set your intentions at this Solar Eclipse! See how the energy of your past and present will impact your future with a Timeline Tarot reading. You might feel like you're floating in an imaginative bubble and time is standing still. However, your inflated balloon could pop when the Pisces Solar Eclipse rattles your 12th House of Escapism. You already realize big changes are looming on the horizon, but their arrival is accelerated by the eclipse. You must meet your current obligations while you still have the chance. Once you tie up loose ends, you will be free to move into the next phase of your life. The clock is ticking and the future waits for no one. You can be so overwhelmed by your imagination that your associates may think you've lost touch with reality. But the Pisces New Moon Eclipse energizes your 11th House of Networking, stimulating your need to be with like-minded people. Your friends and coworkers will take you more seriously if you don't ramble on endlessly about your visions. Share your hopes, but stop talking once you've said what's on your mind. Daydreaming is a luxury but living in the real world is required. Managing all the uncertainty at work might be a challenge, but don't just throw your hands up in frustration and walk away. Although the Pisces Solar Eclipse confuses your 10th House of Career, you can rely on your intuition to find an opportunity in the fog. Paradoxically, the facts will only lead you astray because the rules of the game are likely to change. Shift gears as necessary or take an entirely new approach if your current methods no longer do the trick. Straight lines are not always the shortest distance to your destination. You could be obsessing about the idea of an exotic vacation, and it would be a shame to waste the current opportunity without attempting to realize your fantasy. At this point it doesn't matter whether you can afford to take time off from work or if the costs are beyond your budget. The Pisces New Moon Eclipse electrifies your 9th House of Vision; it is essential for your heart's happiness to try to make your dreams come true. A preliminary exploration won't require additional resources, and you can always wrangle with the logistics later if you decide to actually embark on your escapade. You appear so self-sufficient most of the time that it's difficult to get help when you need it. Your coworkers might be hesitant to offer assistance while constraining Saturn squares the Pisces Solar Eclipse occurring in your 8th House of Shared Resources. Although you would appreciate some support, you don't like the idea of anyone thinking that you're desperate. Thankfully, it's not too late; ask for what you want, even if you must reveal your vulnerability. You don't have to be a model of perfection because people will rally to your defense if you're willing to meet them halfway. A healthier diet and a more disciplined exercise plan usually sounds like a sensible idea, but you might lack the commitment necessary to make it work. Nevertheless, the imaginative Pisces New Moon Eclipse activates your 6th House of Habits, motivating you to begin a new regimen to improve your well-being. Fortunately, your sincere intentions empower you to start a new routine that has a lasting positive impact. Making an enduring little change is better than a big one that doesn't last. A romantic fantasy may be exactly what the doctor orders, even if you don't actually say a word about it for the sake of propriety. The magical Pisces Solar Eclipse flows through your 5th House of Love and Creativity, potentially inspiring a wonderful experience. Don't be concerned if the pleasure takes place only within your imagination since it still can have real implications if you choose to act on your feelings now or later on. Whether or not you tell anyone your secrets, acknowledge your current attractions without worrying about where they could lead. You are wise to keep your feelings to yourself as the disorienting Pisces New Moon Eclipse electrifies your 4th House of Roots. Even if you must head out into the world, your emotions are best left at home. Sharing your private life at work might not be your smartest move if you want to be taken seriously. But don't slip into denial by shutting yourself off from your heart. Writing in a journal or talking about your personal issues with a trusted confidant is the safest bet. Discretion is your friend. A close friend or associate might do something that is totally out of character, but don't let someone else's behavior become the main focus of your day. Although the Pisces Solar Eclipse unsettles your 3rd House of Communication, you have your own agenda to follow and can't waste time untangling other people's motives. If you're compulsively curious, be direct and ask them what's going on. However, if satisfactory answers aren't readily forthcoming, let it go for a while; you can always return to the conundrum when time is not an issue. Your visionary ideas tempt you with many ways to increase your income as the dreamy Pisces Solar Eclipse enlightens your 2nd House of Personal Resources. But financial planning won't necessarily lead to fiscal rewards because you might be misled by your own idealism. Be smart and consider every inspiration that comes to mind, but don't put all your eggs in one basket. Your current key to success is keeping each dream alive until a reality check requires you to leave it in the past. There is no limit to what you can imagine, but there's also nothing to be gained by rushing into anything monumental just yet. The New Moon Eclipse polarizes your creative sign, offering you a new lease on life. You're at the edge of a spiritual journey, but your diaphanous thoughts will eventually solidify into reality. Don't fall victim to a false sense of urgency; move cautiously and consider all your options prior to focusing on any one path. Henry David Thoreau wrote, "The world is but a canvas to the imagination."